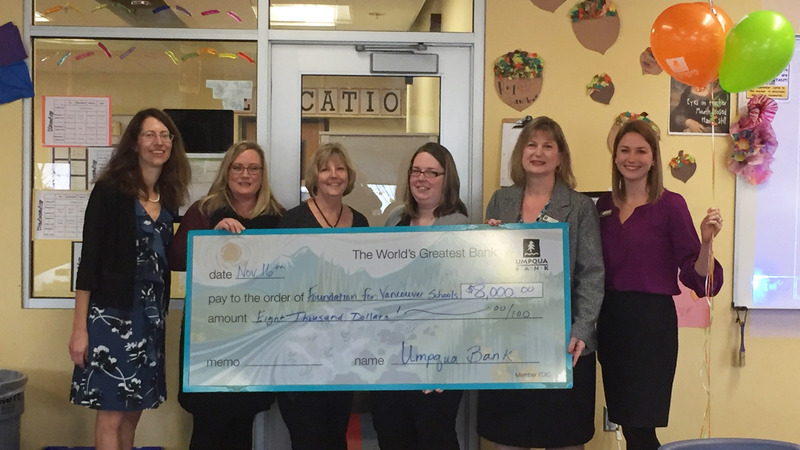 Umpqua Bank’s Charitable Foundation has awarded the Foundation for Vancouver Public Schools an $8,000 Community Giving grant. The funds will be used to expand family engagement activities in Vancouver Public Schools, including experiences and academic-focused events for parents to become involved in their child’s academic success. Umpqua Bank recently announced Community Giving grant awards totaling more than $311,000, with recipients in Washington, Oregon, Idaho, California and Nevada. Since 2014, the Umpqua Bank Charitable Foundation has invested in organizations focused on children’s education and well-being. The bank’s Community Giving grants fund programs that create opportunities for early childhood and K-12 youth that fulfill their educational experience, promote their well-being and inspire them to reach their full potential. Read the original announcement in the October 5, 2016 edition of The Columbian Newspaper.